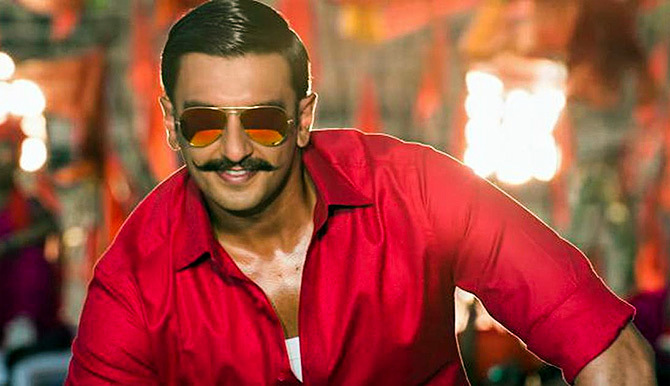 Rediff.com » Movies » Simmba Trailer: Ranveer show all the way! Simmba Trailer: Ranveer show all the way! Like the Simmba trailer? Let us know in the message board below! Ranveer Singh is everything Ajay Devgn is not. He doesn't have that quiet intensity, those amazingly piercing eyes. So his Simmba should probably be everything Ajay's Singham was not. But there's a common factor here: Director Rohit Shetty and his signature brand of over-the-top action. So what happens when Ranveer's high voltage energy meets Rohit's blockbuster cinema? Mindblowing and jaw-breaking action, loud music, bright colours, vibrant and synchronised song-and-dance, crackling one-liners and loads of melodrama! It's a Ranveer show all the way, and we hardly get to see Sara Ali Khan in the trailer. Sonu Sood repeats his act from Dabangg. Maybe it's time film-makers start giving Sonu different roles. We get glimpses of Ajay Devgn as well as he marches in to save the day. Rohit Shetty sends out a message through his cinema that rapists should not be spared. It's a serious message, and needs to be tackled well, sympathetically, showing us something more than what we have seen in Hindi cinema so many times before. Let's see if he achieves that when Simmba releases on December 28. PIX: Ranveer brings Simmba to his fans!